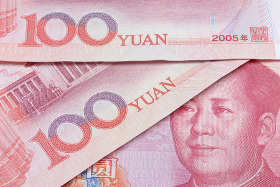 The Chinese yuan is continuing to post significant gains in the aftermath of the US-China trade truce. With trade hostilities suspended for 90 days, the yuan is looking to pare its steep losses, and some analysts believe the currency could become a global heavyweight in the years to come. Now if only the economy would rally as much as the yuan. Over the weekend, President Donald Trump and President Xi Jinping sat down for a face-to-face meeting. While global markets were not expecting much of anything to happen, the two powerful leaders agreed to take a break from trade tensions and try to make some concessions. As a result, the US will not impose 15% hikes on tariffs on $200 billion worth of Chinese goods, and Beijing will reduce automobile tariffs and acquire more agriculture. Negotiators will now aim to establish a trade agreement by the end of 90 days. Investors are doubtful that it will happen as global equities have crumbled. But the yuan is not sharing the same sentiment as financial markets, which seem skeptical that the world’s two biggest economies can etch out a new trade pact. But some analysts believe that the yuan will experience a resurgence in the next few years – with or without a trade deal with the US. They argue that the currency will play an important global role as the nation permits greater foreign capital into the country. So, if you look along that direction there’s no way the yuan can be a weak currency, otherwise people won’t accept it and it cannot be a global currency if it’s a weak currency in the long term. These remarks echoed the sentiments of HSBC, which presented the case that capital account flows will likely have a greater impact on the future of the yuan than international trade. Meanwhile, in the days following the big announcement, the People’s Bank of China (PBOC) reiterated its position that it will maintain a flexible monetary policy. Governor Yi Gang explained that the central bank needs to employ a “slow release of air” and adopt a “soft landing” once the economy overheats or asset price bubbles form. The USD/CNY currency pair declined 0.67% to 6.8371, from an opening of 6.8834, at 15:40 GMT on Tuesday. The EUR/CNY fell 0.51% to 7.7687, from an opening of 7.8089.